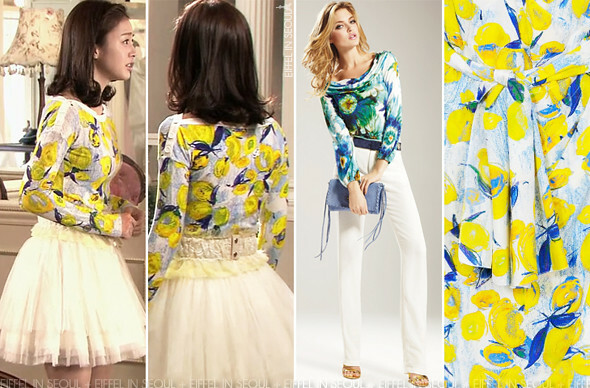 In episode 14 of MBC drama, My Princess, actress Kim Tae Hee (김태희) wore a black and white top from Moschino Cheap & Chic Pre-Fall 2010 collection as well as a hot pink dress from Nina Ricci Resort 2011 collection. Much like Blair Waldorf in Gossip Girl, one of the highlights of Kim Tae Hee (김태희) outfits are her headbands which really complimented her looks. I throughly enjoyed both looks above. However, it was a disappointed in episode 15 of the drama. Wearing a Lemon-Printed top from Blumarine Spring/Summer 2011 main collection with a white tulle skirt, one of my least favorite outfit. I really dislike the prints and personally think it doesn't suit her. I've been trying to finish the remaining looks for 'My Princess' since I got carried away with fashion week. This will be ther last post for 'My Princess' and I will move onto the next drama, Midas which I can't wait to post. I hope you enjoyed all the fashion finds for 'My Princess'. Thanks for posting all these looks from my princess, I really enjoyed both the outfits and the drama itself.